but forever our sanctuary the theatre remains. When I was two, my big sister’s girl scout troop attended Festival Ballet Providence’s Discover Dance performance of The Nutcracker, part of a program wherein schools, church groups, senior citizens and other small communities that may not otherwise have the opportunity are invited to view a daytime showing for a highly reduced rate. Since my mother was wildly active in all things field trip, volunteer, organization and arts, and I was just a wee little Keeks, I tagged along for the day. Now, just to clarify, when I say my mother was(is) wildly involved in the lives of her children, I mean she was not just on the PTO- no- she ran the PTO. She not only attended every academic ceremony and school function, but would most often arrive several hours early to help plan. Perhaps best of all, though, was the special tradition my mom established at my old elementary school, a brainchild of hers aptly called Creative Awareness. A week-long celebration of the arts, my mom’s Creative Awareness embraced the unabashed creativity of the young, speckling the halls of Aitken School with colorful student artwork and rogue 5th graders flute, trumpet, and clarinet-ing their tiny, expressive hearts out. This art appreciation week culminated in an elegant evening talent show, featuring students framed in decor so classy it caused audience members to question their whereabouts and out-of-districters to purchase new properties (probably). It comes as no surprise, then, that my mother- girl scout troop leader and overall art enthusiast- would orchestrate a trip to the ballet. At the ripe age of 24 months, I had been exposed to an impressive repertoire of live theater (pretty sure I saw Into The Woods from inside the womb), heck, my mom even co-created and directed a children’s theater group which I acted in for the first twelve years of my life! But this Nutcracker thing- this ethereal, floating, wordless bit of magic- this was my first experience with real ballet. Twenty years later, that know-it-all oddly accurate little girl has just fulfilled a pretty incredible dream. As my pointes brushed the hard stage of PPAC Friday morning and the child-dense house applauded my (rather shakey) double pirouette approximately 30 seconds into the grand pas de deux, two-year-old me craned her neck up. Little Kirsten smiled her smile across my face, bearing her teeth through since-painted lips. She leapt with abandon and reached her gaze up to the highest balcony, desperate to absorb every bit of this antipodal view before Tchaikovsky’s final horn silenced. 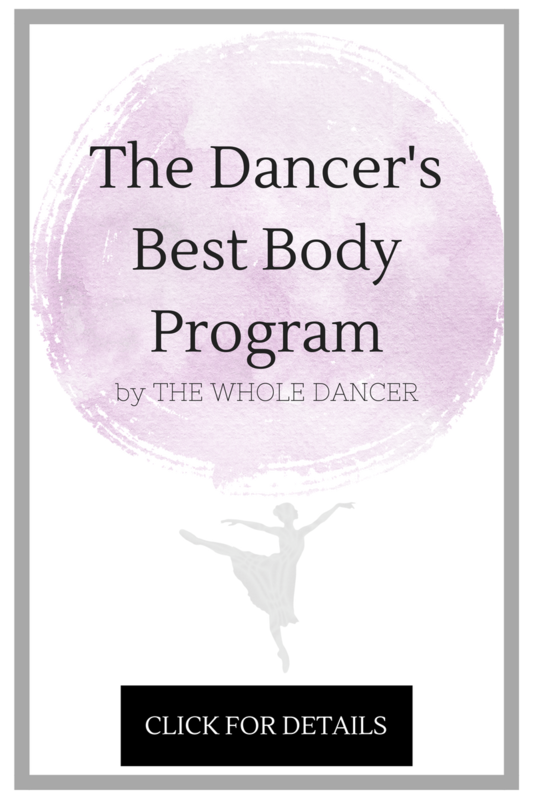 It’s difficult to express my feelings about FBP’s Discover Dance program. But doesn’t that tend to be the case when such unselfish things so directly effect your own life in a way that feels self indulgent? If from my performance last week, even just one child drew a fraction of the inspiration that I did in watching it all those years ago, my heart will surely be full for the next twenty. 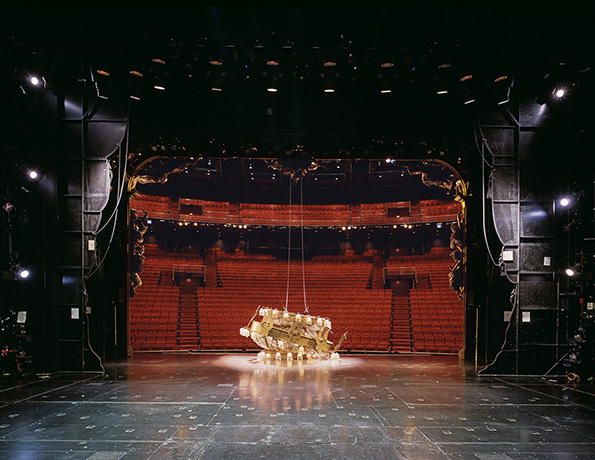 As a child of performing arts, the view of an empty theater from behind the “fourth wall” is wildly nostalgic. To me, the rows of vacant seats are not hollow, but filled instead with a warm familiarity. They are balanced, orderly, reliable. Overflowing with the promise of their imminent fullness, but still an expression of beauty as they wait. 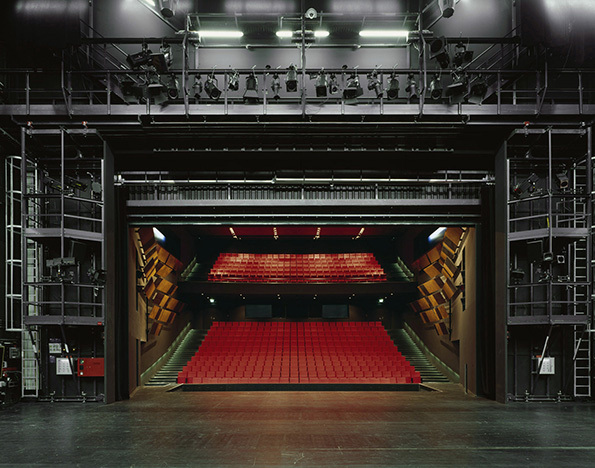 Arriving hours before opening to prepare for performance, I silently converse with the sacred space which lives in the absence of a dark red curtain. 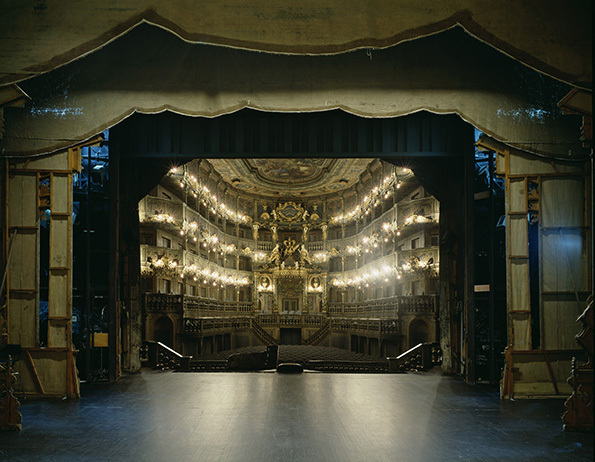 I see the theater in its polished glory. I see its restful moments in between shows. And so too, its occasional center stage nap. 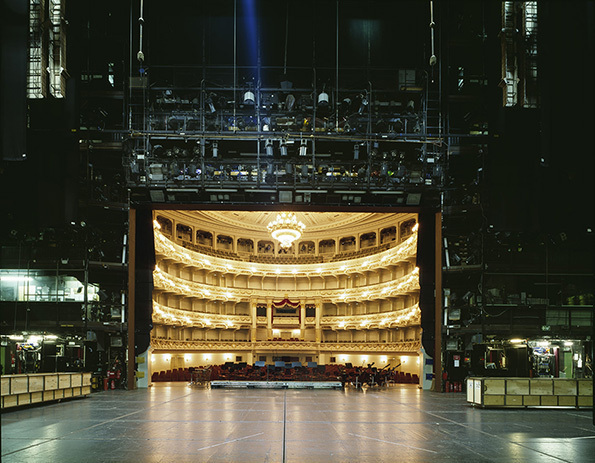 Hamburg-born photographer Klaus Frahm created a series of images featuring European theaters captured from behind. The collection feels oddly personal to me, like a visual documentation of my relationship with performing. 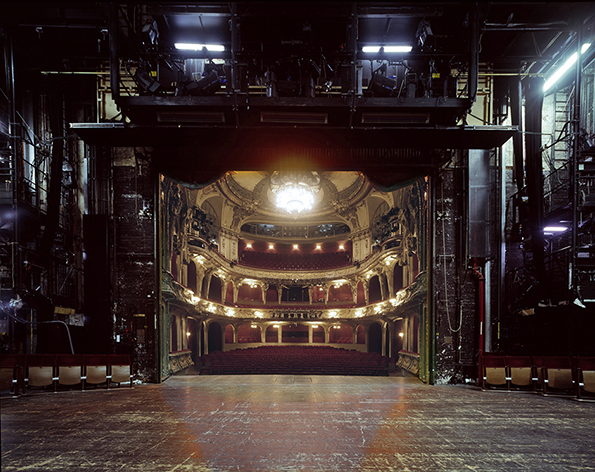 Equally insightful is Frahm’s philosophy regarding the art of photography as “revealing something laying under the surface”, a concept beautifully manifested in his work. 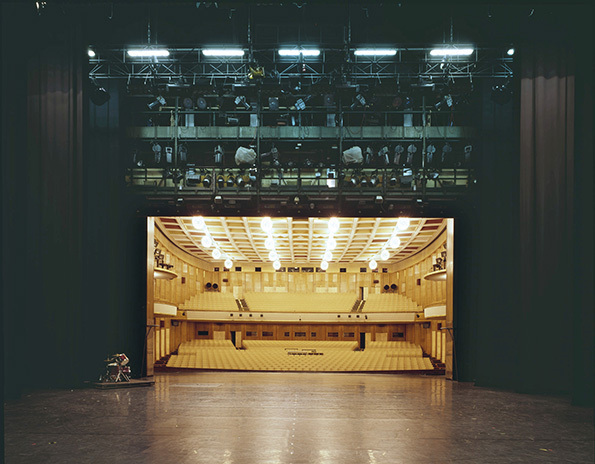 Though as diverse as the countries they inhabit, there’s a strange sense of continuity in a venue specifically intended for the sharing of performance art. 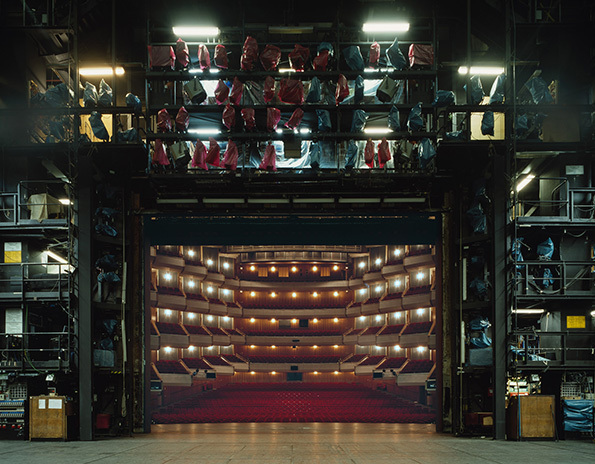 I find looking out at a theater from the perspective of the performer always provides a sense of home, whether that stage be in Rhode Island or Russia. “At my home, Maine State Ballet, there isn’t a person in the building who fails to snap to attention when the words, ‘The Estys are here’, trickle down the hallways. We all know who they are; their names have become somewhat of a legacy. Twins Sara and Leigh-Ann Esty, from small-town Gorham, Maine, have roots planted firmly with our school and company. They not-so-quietly climbed through the ranks and took on roles as prestigious as the Dew Drop Fairy in The Nutcracker. A dynamic duo they are. Sara was kind enough to work in between her busy schedule and indulge me with a Facebook conversation about her new and exciting life. Firstly, congratulations on your life (no, seriously). 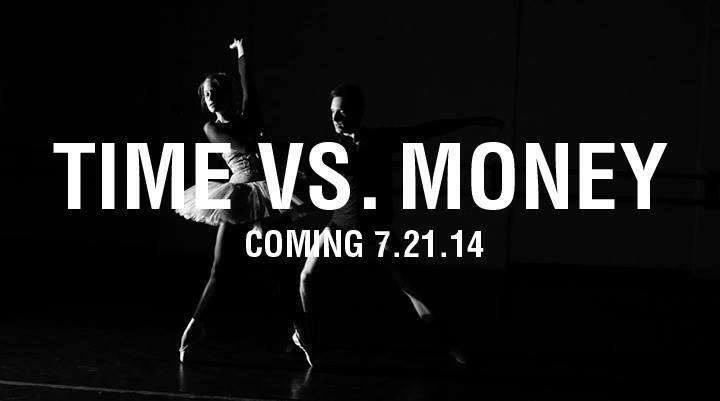 You’ve certainly taken advantage of this blossoming crossover between ballet and Broadway. How did this opportunity come about? Thank you so much!!! So I had been with the ballet company in Miami for about 10 years and one day I literally got a random Facebook message. It was from a casting director in NYC, saying she was working on a new project with Christopher Wheeldon for Broadway and asked if I would be interested in contacting her. There was no doubt in my mind that the answer was yes! Two of my favorite worlds were colliding – how could I not be part of it? I wrote her back and soon came to find they were looking around in professional dance companies for artists interested in singing and acting for a new version of An American in Paris. The rest is history! That’s incredible. Has Broadway always been something on the bucket list? I think I’ve always had a theatrical personality and drive about me, but it wasn’t till around high school that I made the promise to myself it would happen someday. Haha! Yes, I mean all I was prepared for was to do what I know how to do… The rest was icing on the cake. I love the show and the experiences and places it has brought me so far. It can be overwhelming at times but mostly exciting and extremely gratifying! What an adventure… Could you describe a typical day for the cast while you guys were in Paris? Well, we had the mornings off typically and then would rehearse a bit after around noon. Shows were around 7 or 8. Other than that we had Paris at our finger tips! I understand that you and Leigh-Ann have been blessed to work side by side one another for almost all of your professional careers. How are you coping with being separated for the first extended period of time? There are rumors twirling around that you’re dating a fellow cast member, can you confirm or deny them? Last question! How did it feel to perform as the lead for the first time at the Palace Theatre? I can’t thank Sara enough for taking time out of her wonderful, busy life to indulge her fans! You’ll never meet more gracious, humble, extraordinary people than Sara and Leigh-Ann. Thank you Rhiannon and Sara for your contributions. Such a fun read! If you haven’t already seen Misty Copeland’s new ad for Under Armour, you have probably been living under a rock for the past week. The muscular beauty, who made her name as the first female African-American soloist with ABT, proves that ballet is more than tutus and tiaras in this gritty, striking commercial for the popular sportswear brand, which recently named Copeland as their latest spokesmodel. And boy, did they choose well. When I first saw Misty Copeland dance in ABT’s Swan Lake a few summer’s ago, I’ll be honest- I didn’t think much of her. Clouded by the hype of her famous name, and skewed by the talents that surrounded her onstage, I remember being slightly underwhelmed by Miss Misty. Fast-forward 3 years, I’m following an old dance friend from RI on this season’s series of So You Think You Can Dance, and sitting next to Nigel So-and-So, is a woman so graceful even in her judge’s chair, she almost danced as she sat. First I noticed her toned biceps, then her delicate collarbones. She swiveled in her chair, and her calves suggested a runner, but her ballerina bun contended otherwise. Her gracefully athletic, elegantly powerful build gave away her identity before she even spoke; It could only be the unlikely ballerina whose story of “adversity and grace” she penned into a best-selling novel, her infamously strong and “un-ballerina-like” body heightening the debate of whether or not ballet is considered a sport. I was quickly impressed by the insightful constructive criticism she had for each dancer on the show, and the eloquence with which she delivered her comments. Just like that, in the most unexpected of mediums, Misty Copeland became someone I admired. Only a few weeks later, Ms. Copeland’s much-awaited commercial for Under Armour was released, and my adoration grew. The ad supposedly crushes the debate over whether or not ballet is a sport, featuring the voice of a young girl reading real rejection letters received by a younger Misty, as Copeland herself cuts through the stage with all the strength and power of a professional athlete. Of course, it begins with a slow, controlled, relevé, displaying a level of poise only possessed by a prima ballerina. 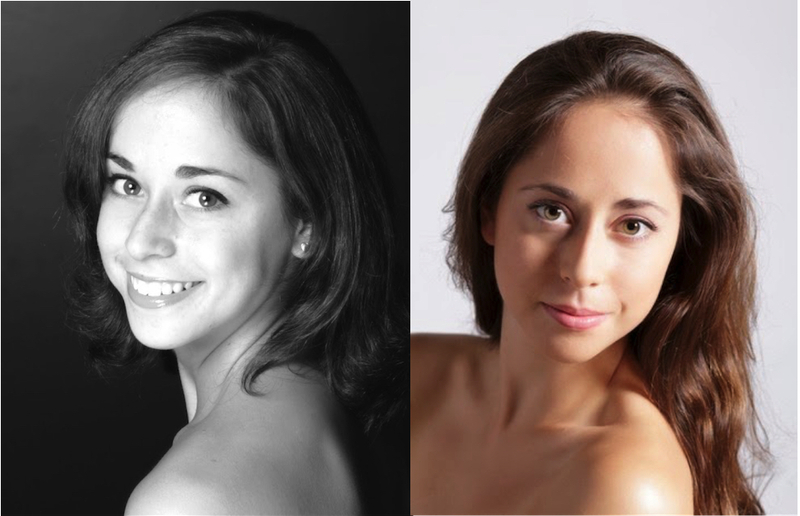 So in the great debate of ballet: Art or sport? A little of both? What do you think? Today is the day! I’m very excited to finally share the music video for The Bynar’s Time vs. Money. We worked so hard to create this, and I think the final product tells that story itself. I am beyond proud to have been a part of this project, and hope you all enjoy watching. Remember that music video A and I began working on just one day after Peter Pan? Welp, folks, it’s been edited, cut, stretched, snipped, nipped, pasted, fluffed and smoothed, and it’s all ready for the big premiere next Monday, July 21st. I just saw the final version this morning and guys, it’s good. Between Viktor Plotnikov’s choreography, the genius of the film crew and the charged music of The Bynars, this video is a true collaboration of artists. That’s what I’ve loved most about this summer, so far; It’s been a summer of artistic collaboration. I’ve taken every opportunity that has come my way, even the ones that have always scared me (hello, teaching! ), without trepidation. It’s like I’ve broken through this barrier that’s held me captive in my own skin for so long. I’m not sure exactly when it happened (did something dissolve while I was hovering above the stage the first time that harness lifted me up to Neverland? ), but what really matters here is that something did happen. Something changed in me. And isn’t that what your twenties are all about anyway? Trying new things and saying “yes” even when it seems like the worst thing to say? This new mantra has lead me to so many places I never thought I’d be this summer, one of which I visited just last week, with yet another photoshoot…stay tuned. first photo via Shaun Clarke. second photo via my instagram.